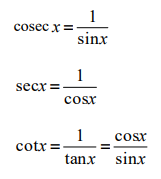 Unsure about Further Trig Functions? A sound understanding of Sec, Cosec and Cot is essential to ensure exam success. At Higher we know about Sine, Cosine and Tangent of x. Through step-by-step worked solutions to exam questions available in the Online Study Pack we cover everything you need to know about Further Trig Functions to pass your final exam.